Good morning! Michele here with another card using the no line coloring technique. I love that the image looks more like an illustration rather than a stamped image! Creating the Birthday Girl Card. First, I stamped my image with a pale grey ink and colored it with Copic markers. To give her hair and dress a bit of shine and glitter, I used a clear Wink of Stella pen. Next, I adhered the image to a pink tag and blue background with Crafty Foam Tape to give it dimension. Because this cute tag needed a little something more, I dressed it up a bit by tying a ribbon through the top opening. Then I secured the flower and sprigs with Dodz Adhesive Dots Medium. To embellish her dress and hair, I added a couple of teeny flowers using Adhesive Dots Micro. Finally, add the embellished tag on top of a layered tall card base. I hope you try this technique on your next card! Thank you so much for stopping by today! 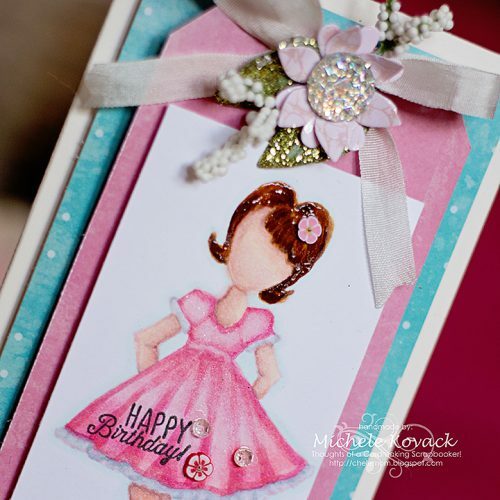 This entry was posted in Adhesive Dots & Lines, Adhesives, Cards, Crafts & Tutorials, Crafty Foam Tape, Permanent Adhesive and tagged Adhesive Dots Medium, Adhesive Dots Micro, Birthday, Card, Crafty Foam Tape White, Flowers, Michele Kovack, Ribbon. Bookmark the permalink. 3 Responses to "Birthday Girl With No Line Coloring"
Wow !! That’s such a lovely card! I love your different mats.